The Waco Regional Baptist Association is a non-profit organization. Every donation (monetary, time, supplies and prayer) counts in supporting local Baptist churches and their efforts to engage our community. To learn more about opportunities to support and donate to WRBA, email admin@wacobaptists.org. 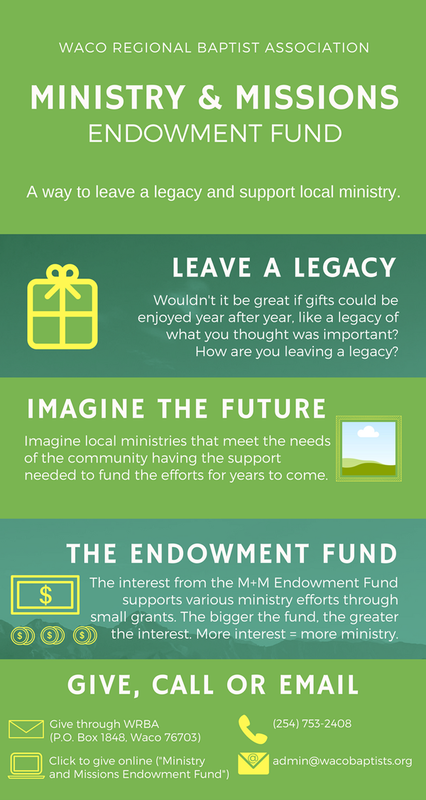 Through the Missions and Ministry Endowment Fund, we are empowering our ministry teams and churches to dream of changing the future for the better. The growth of this fund will expand and extend the collaborative mission efforts of our WRBA churches. The Networking and Missions Team were able to give additional funding to churches for mission efforts locally and globally. The Student Ministries of the WRBA, on the campuses of MCC and TSTC, direct students to new Bible Studies, Evangelistic Events and Mission opportunities throughout the year by providing study materials and school supplies, food, etc. We dream of growing this MISSIONS AND MINISTRY FUND to a Million Dollars so that it can produce a significant boost to these cooperative missions in the region. Each year some of the growth and earnings of this fund will be made available to our WRBA Ministry teams to do things they never before imagined possible. Would you join us in this effort and consider making a gift or a bequest to the MISSIONS AND MINISTRY FUND of the Waco Regional Baptist Association? To make a bequest to the Waco Regional Baptist Association, you simply need to include our full legal name, “Waco Regional Baptist Association” and our Federal Identification number 74-6011083 in your will or as a beneficiary of your insurance. This is an opportunity to leave a lasting legacy in local ministry. The interest from this endowment fund supports local ministry grants each year. Your donation contributes to the growing interest each year and therefore supports local ministry efforts every year.